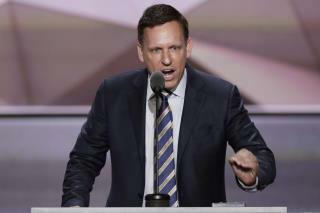 (Newser) – Tech billionaire—and gay man—Peter Thiel was one of the more unexpected speakers lined up for Thursday's final night of the Republican National Convention. But he earned chants of "USA" from the crowd when he announced: "I am proud to be gay. I am proud to be a Republican. But most of all I am proud to be an American." CNN notes Thiel is the first Republican convention speaker to proudly declare he is gay. Thiel, who most recently made headlines for funding Hulk Hogan's lawsuit against Gawker, said he doesn't agree with the entire Republican platform but believes Donald Trump is the only one who can lead the country "back to that bright future" he remembers from his childhood. “Our government was once high-tech," Thiel said. Now he says the government is broken. Oh no, some gay guy broke away from the HERD! If you're born gay, how the hell can you be "proud" to be gay? That's like "proud to be blue-eyed" or "proud to be right-handed." Dipsticks. who the hell cares and what will it do to change the country?